Honey Cashew Cookie Bars are chock full of crunchy cashews in chewy honey caramel on a brown sugar shortbread base, all drizzled in chocolate. When I first came up with the idea to use cashews in this recipe, I immediately thought of my Mom who is a big fan of cashew nuts. I must stick a few in the freezer for her. These are one of my favourites in the dozens of cookie recipes available here on Rock Recipes. I share my Mom’s love of cashews and the chewy honey caramel on a brown sugar shortbread base is as near to simple perfection as I can imagine. I had to force myself away from these after the third cookie. A little chocolate is never a bad thing but honestly, these simple cookie bars are absolutely delicious all on their own; try them whichever way you like. 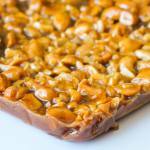 Like this Honey Cashew Cookie Bars recipe? Honey Cashew Cookie Bars - These are a cashew lovers dream cookie bars. Plenty of crunchy cashews suspended in a soft honey caramel all on a brown sugar shortbread crust. Mix in the flour until fully incorporated. Press into the bottom of a 9×13 inch, parchment paper lined baking pan. In a medium sized saucepan combine the butter brown sugar honey and whipping cream. Bring to a gentle boil and simmer for only a minute or two before stirring in the cashews. As soon as the bottom has baked for 20 minutes, pull it out of the oven and spread the topping evenly over the base and return to the oven for an additional 20 minutes. Careful not to over bake these or the caramel top will go brittle and not chewy. If you have a candy thermometer you can test the top layer to ensure that it is somewhere between 245 to 250 degrees F when fully baked. Cool completely the pan on a wire rack. Drizzle the tops with the melted chocolate if you choose. These are exceptionally good without the chocolate too. I am making these! Wonderful! 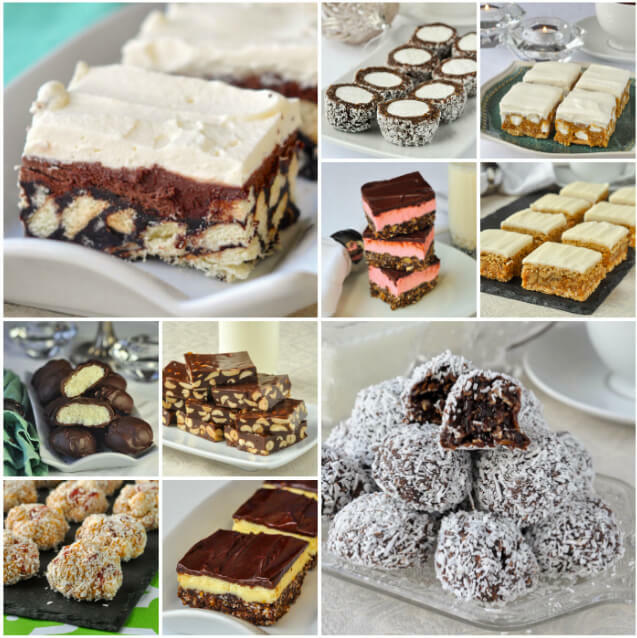 These look like perfect treats to make for the Christmas holidays. Thanks for posting this recipe. Do you use all purpose flour in your baking? Mostly all purpose. I do use cake flour sometimes when noted. Duh didn’t see unsalted, can I use salted just spent 10.00 on them. It wont keep the mixture from sticking to them will it? Salty sweet treats are pretty trendy these days (ie salted caramel) so I’d give it a try. Roll the salted cashews over a clean tea towel with your palms to remove some of the salt and use unsalted butter in the recipe if you can. They might just be great. These are AMAZING. We didn’t use the chocolate drizzle either. My husband made these for dessert after Christmas dinner – it will be a miracle if they even make it that long. We couldn’t find unsalted cashews, so we used salted – still amazing (or, maybe more amazing, we haven’t tried with unsalted). Can you use peanuts instead for someone who is allergic to other nuts? For the top layer…What time it would take to make caramel as i burt it in 3 minutes? Do we use powdered brown sugar or granular sugar? I’ve never used anything but granular. You just have to boil it for a minute or two as the recipe instructs. Don’t use heigh heat either.